By the way, the pump in question was said to have pumped 3 thousand million litres a year. If running 24 hours a day to do that, it would have been pumping 8,000 tonnes a day. That'd be about 0.5% of the 1.5 million tonnes a day being pumped last month. Now there's an additional 7.5 million tonnes a day being pumped with the massive pumps on loan from the Netherlands. (See below). Here is a picture of the just part of the flooding in Somerset. Could one lone pump have stopped all this? 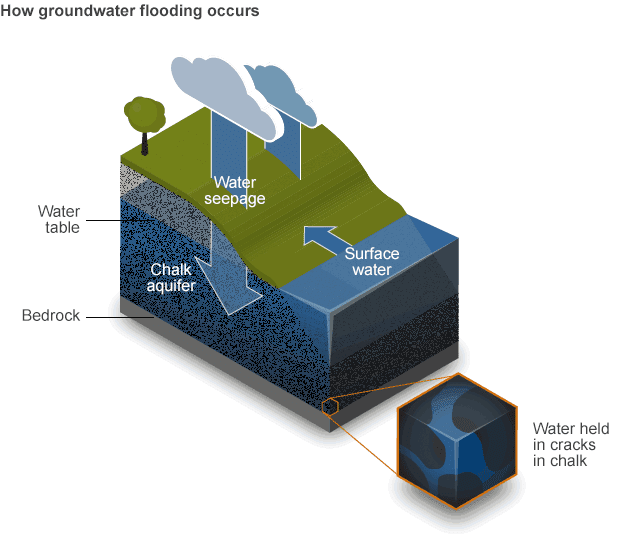 Groundwater levels are so high in some parts of the country that flooding is likely to persist for weeks or even months, experts say. Back to Somerset. Thing is, if you're pumping flood waters you've got to have somewhere to pump it. When there's water, water everywhere you've got to take a lot of care. On the Somerset Levels Environment Agency teams continue to operate up to 62 pumps, 24-hours a day, to drain an estimated 1.5 million tonnes of water (equivalent to 600 Olympic-sized swimming pools) off an area of the Levels spanning 65 square kilometres – the biggest pumping operation ever undertaken in the county. 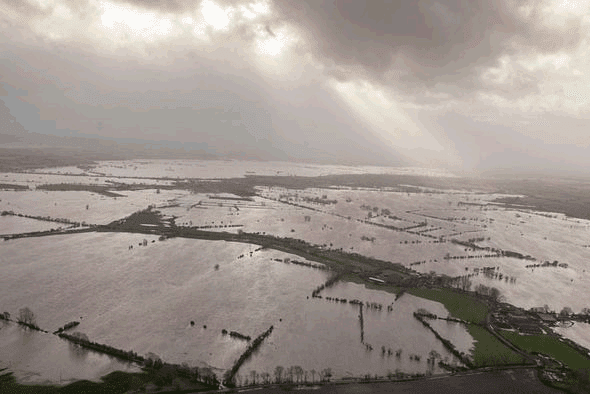 The Environment Agency has been working with other agencies on some short term, emergency options to maximise the amount of floodwater that can be pumped away from the Somerset Levels and Moors. This includes pumping to the Taunton and Bridgwater Canal and increasing the volume of floodwater that goes down the Sowy in the River Parrett Alleviation Channel. Pumping at Beer Wall and Dunball to increase the floodwater going into the Sowy is due to start this week. 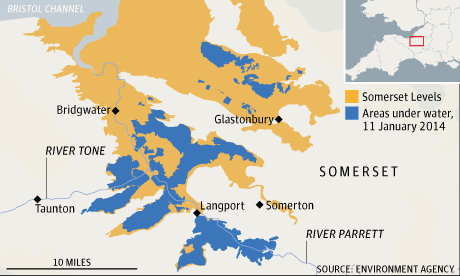 A statement from Avon and Somerset Police said all “risks and benefits” across the Somerset Levels and Moors have been considered in making this decision. Two pumps from the Netherlands are being used to try to reduce water levels at the flooded Somerset Levels. The area began flooding more than six weeks ago and the continuing heavy rain has since flooded dozens of homes. Despite what you read at WUWT, the 1929-30 winter isn't listed as the wettest winter. 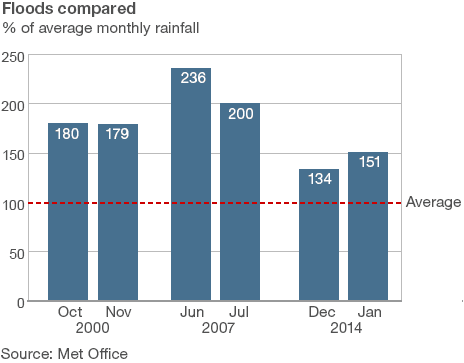 All countries except England had their wettest winter in the 1990s and in England, the wettest winter was in 1915. Dame Julia Slingo said the variable UK climate meant there was "no definitive answer" to what caused the storms. "But all the evidence suggests there is a link to climate change," she added. "There is no evidence to counter the basic premise that a warmer world will lead to more intense daily and hourly rain events.". I will be interested to see how much fuss Anthony and his mates make of the fact that this winter in the UK hasn't followed the pattern of the last few with some extremely cold days in central England. In fact, it feels very mild for the time of year (and in my bit of central England it isn't raining for once and the local floods around here might go down a bit). I wonder how long it will take Australia's climate denying politicians to wake up to the fact that there may be political mileage in blaming droughts, floods and fires on global warming? They are currently getting a lot of flack for not responding adequately to the major droughts in many parts of the country. It may come when they decide drought relief and flood relief is too expensive in some areas, and that they'll let the property owners go under rather than try to keep marginal land, that's becoming too marginal for agriculture. Our local politicians are currently floundering around in muddy waters here in Somerset http://bit.ly/1kLUY61 & http://bit.ly/1nEqiRi as the elections loom. "Money no object" Cameron acting like Canute, and suddenly climate change can be discussed as fact rather than fiction. A glimmer of hope in the tragedy of mud & flood. A couple of months ago George Monbiot suggested that some hill-farming should be abandoned in favour of re-wilding, to hold back rainwater, the Farmers union went predictably ape-doodoo. Now they say it's worth talking about. UPDATE2: Upon further inspection of satellite images and flood maps I’ve concluded that while what this commenter had to say about the history is indeed true, the impact in this situation is not particularly relevant.